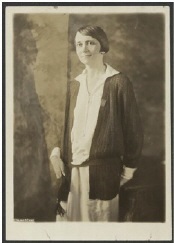 Sue Shelton White, of Jackson, Tenn., was state chairman of the National Woman’s Party and one of the editors of The Suffragist weekly newspaper. She was a court and convention reporter for ten years and in 1918 was appointed by the Governor of Tennessee to the State Commission for the Blind. She was active with the United Daughters of the Confederacy and the Daughters of the American Revolution, as well as the Federation of Women’s Clubs and the Parent Teachers’ Association. She was arrested Feb. 9, 1919, and served five days in District Jail for participating in a watchfire demonstration. She soon after participated in the NWP’s “Prison Special” tour of the United States. She is largely credited with helping win ratification of the 19th Amendment by helping win passage in the Tennessee legislature- the 36th and clinching state for ratification. Shelton eventually earned her law degree in 1923 and helped to draft the Equal Rights Amendment (ERA). She soon left the NWP after being discouraged by President Hoover’s failure to support the Amendment.